In order to run smoothly, your car needs regular servicing and maintenance, including a radiator flush and change of spark plugs. Although our bodies are generally self-servicing, small, degenerative changes occur as we grow older, says Dr. Geraldine Mitton in the Anti-Ageing Handbook. Moreover, aging is associated with impaired detoxification processes. It is not normal to have indigestion, constipation, aches and pains, headaches or fatigue. The liver is the major organ of detoxification and your health and energy are largely dependent on its efficiency, says Dr. Mitton. 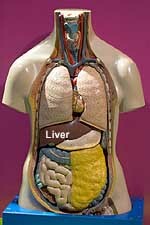 Every substance that is absorbed by the intestines must first pass through the liver before going on to the general circulation. It disposes of a daily dose of toxins produced internally from bowel contents, food, water and medications, and externally from the air you breathe. When your liver is not functioning properly you will feel sluggish and possibly nauseous. Your eyes can be affected by the liver in many ways: for instance, bloodshot eyes may mirror the condition of an overloaded liver. Poor liver function is caused by accumulated toxins such as alcohol and caffeine, incorrect diet, overeating and medications such as anti-inflammatory drugs. Many diseases, including cancer, rheumatoid arthritis, and brain degenerative disorders are associated with poor liver function. Therefore, to live better and longer, detox regularly. High-content site on detoxification with special emphasis on techniques for cleansing particular systems. Several methods of detoxification are currently available — fasting, diets, colon therapy, vitamin therapy, chelation therapy, and hyperthermia. Dr. Ted Spence shares detox information including herbal detox, juice detox, diet detox, and more.